Looking Back to Moving Forward - Bookkeeper Girl - Affordable. Online. Trustworthy. Many people believe mixing the old with the new gives you the best of both worlds, and that’s the foundation of Bookkeeper Girl: Mixing good ol’ fashioned hard work with new technology to bring our clients the best bookkeeping service possible. Our physical foundation is also a blend of old and new in that our home office is situated in the Texas Building, which is a newly remodeled historic building on the Denton Town Square. The hotel burned in 1884 and was replaced with the May Building, which burned in 1924, according to an article in The Denton Record Chronicle by Karina Ramirez (Dec. 8, 2011). The current version of the building that we call our corporate office home was built in 1925. Since then the building has gone through a number of different owners and has been home to a variety of businesses such as drug stores, a U.S. post office, and business offices. But, it wasn’t until 1964 that the building was named the Texas Building, after it was bought by John Porter and a group of investors. In 1973 the Texas Building became an historical marker in Denton after the city received a request from a Lacy descendent. The building went through afew more owners and remodels before being majorly renovated in 1994 by building manager Scott Brown, who conducted a lot of research in order to maintain the integrity and history of the building. Versus Real Estate Advisors bought the Texas Building in 2011 and have begun once again to completely renovate the building, while maintaining and protecting its historic value. “Our process is simple. We focus on historic buildings that we can completely renovate to bring them into current times as far as amenities and performance,” said Bryan Korba building owner. Korba’s team has certainly honored the history of the Texas Building while accommodating today’s infrastructure demands with new electrical, plumbing, and heating/air conditioning systems. 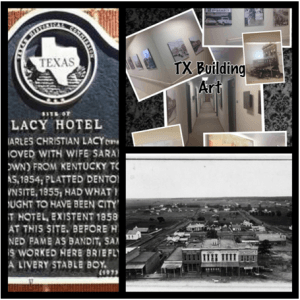 The halls are nicely decorated with modern,Texas-themed wall art as well as historic pictures that continue to capture attention! “The Texas Building is a combination of our vision to take historic properties in communities where people continue to enjoy their city, people, and history and breathe new life into themto create environments that combine the old with the new,” Korba said. Today the Texas Building is home to a variety of offices and businesses owners who work as hard today as in years past to deliver services of value. From maintenance of horse stalls to maintenance of financesand from restoring buildings to preserving history, Pollard and Korba both love the majesty of the Texas Building- where history mingles with the future, paying respect to tradition while welcoming innovation! Learn more about us by following us on Facebook here. Fun Fact: Charles Christian Lacy was also Public Land Surveyor and was the one who named Denton’s streets after trees (Oak, Maple, Elm, Hickory and etc. ).